Situated in a submerged continental rift, Pantelleria is a volcanic island with a subaerial eruptive history longer than 300 Ka. Its eruptive behavior, edifice morphologies, and complex, multiunit geologic history are representative of strongly peralkaline centers. It is dominated by the 6-km-wide Cinque Denti caldera, which formed ca. 45 Ka ago during eruption of the Green Tuff, a strongly rheomorphic unit zoned from pantellerite to trachyte and consisting of falls, surges, and pyroclastic flows. Soon after collapse, trachyte lava flows from an intracaldera central vent built a broad cone that compensated isostatically for the volume of the caldera and nearly filled it. 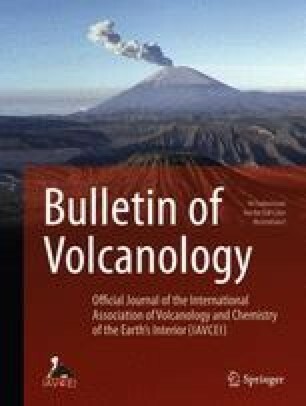 Progressive chemical evolution of the chamber between 45 and 18 Ka ago is recorded in the increasing peralkalinity of the youngest lava of the intracaldera trachyte cone and the few lavas erupted northwest of the caldera. Beginning about 18 Ka ago, inflation of the chamber opened old ring fractures and new radial fractures, along which recently differentiated pantellerite constructed more than 25 pumice cones and shields. Continued uplift raised the northwest half of the intracaldera trachyte cone 275 m, creating the island's present summit, Montagna Grande, by trapdoor uplift. Pantellerite erupted along the trapdoor faults and their hingeline, forming numerous pumice cones and agglutinate sheets as well as five lava domes. Degassing and drawdown of the upper pantelleritic part of a compositionally and thermally stratified magma chamber during this 18-3-Ka episode led to entrainment of subjacent, crystal-rich, pantelleritic trachyte magma as crenulate inclusions. Progressive mixing between host and inclusions resulted in a secular decrease in the degree of evolution of the 0.82 km3 of magma erupted during the episode. The 45-Ka-old caldera is nested within the La Vecchia caldera, which is thought to have formed around 114 Ka ago. This older caldera was filled by three widespread welded units erupted 106, 94, and 79 Ka ago. Reactivation of the ring fracture ca. 67 Ka ago is indicated by venting of a large pantellerite centero and a chain of small shields along the ring fault. For each of the two nested calderas, the onset of postcaldera ring-fracture volcanism coincides with a low stand of sea level. Rates of chemical regeneration within the chamber are rapid, the 3% crystallization/Ka of the post-Green Tuff period being typical. Highly evolved pantellerites are rare, however, because intervals between major eruptions (averaging 13−6 Ka during the last 190 Ka) are short. Benmoreites and mugearites are entirely lacking. Fe-Ti-rich alkalic basalts have erupted peripherally along NW-trending lineaments parallel to the enclosing rift but not within the nested calderas, suggesting that felsic magma persists beneath them. The most recent basaltic eruption (in 1891) took place 4 km northwest of Pantelleria, manifesting the long-term northwestward migration of the volcanic focus. These strongly differentiated basalts reflect low-pressure fractional crystallization of partial melts of garnet peridotite that coalesce in small magma reservoirs replenished only infrequently in this continental rift environment.